As advances in technology and innovation are kicking the toy industry, toys are no longer a preserve of kids; adults are equally crazy about them. Who wouldn’t love to play with uber-cool electronic toys which seems like they’ve just appeared from the cool videos games? So, nowadays people are adopting gadgets like hover-boards, RC mini-copters, electric scooters, radio-controlled cars, and electric skateboards as their hobbies. It’s an amazing idea to have a hobby, and with a hobby as off-roading RC cars, you’re definitely someone many look up to. With that said and done, when you’re starting with RC cars as a hobby, you’d want to start with something that won’t cost you so much. Continue reading this review so you know the best RC cars under 100 dollars, which will be ideal for you to get started. Going by the sheer number of RC cars out there, you’ll definitely find a bunch of low-cost RC car models that compete pretty well with their expensive counterparts. Choosing one model for your needs can be made worse if you already have a decided budget in mind, and this is why we have complied this review to help you choose RC cars under $100. If you’re looking to get knowledge before buying a remote controlled car, then you’re in the right place. If you’re looking to buy an RC car, then you most definitely need to know a few features about RC cars under $100. Here’s a review of top five best RC cars under 100 dollars available in the market. Your dream of owning a remote controlled car has just inched closer. But before we get to the top five budget RC cars, just what do you check for in an RC car? This RC car model can reach speeds of 30 miles per hour. This is perhaps among the best electric RC cars. This model is equipped with a powerful motor providing speed of up to 30 MPH. The scale electric system features a rechargeable battery that you can recharge anywhere with a USB port. It takes approximately 2.5 hours to charge it fully and this will give you about 10 to 15 minutes of battery time. Like its counterpart the SXJJX RC rock off-road car, the Demaxis RTR model comes with off-roading capabilities and a 4-wheel drive system. It features oversized rubber tires that are helpful in increasing traction and reducing friction. These tires let this hobby grade RC car climb over all terrains and obstacles. In addition, its radio transmission system provides a transmission distance of up to 75 meters, which is definitely more than enough. This powerful radio transmission system allows for two or more RC cars to race at the same time. So you can ask your peers to bring along their cars too. By just looking at how this car has been positioned in the package, you’ll definitely know that it’s capable of all impossible tricks you can think of. The Rock Crawler features two motors and a low gearing which gives it a rugged off-rad action. This car runs on 6AA batteries while its remote control runs of 2AAA batteries. It features a tri-channel transmitter and an impeccable off-road capability. 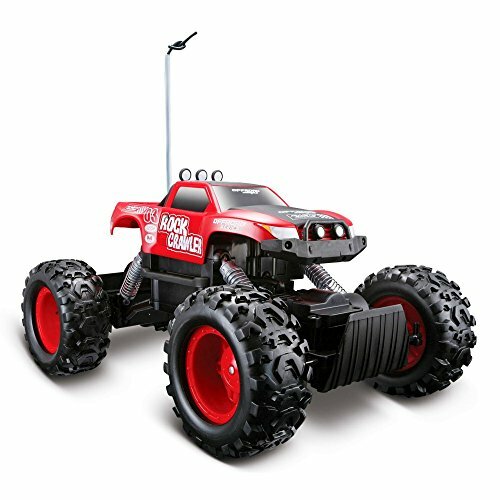 The Rock Crawler RC car can almost provide as much thrill as a real-life off-road experience expect the element of danger associated with real off-road racing. 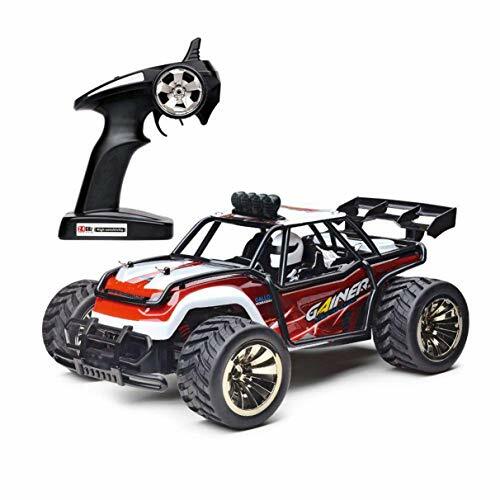 Its TPE tires makes the grip so good and features a tri-channel transmitter allowing for three players to participate, each with their own RC car at the same time. This model gives you good value for money expect that some users have complained about the batteries as well as its climbing capabilities. It can be annoying sometimes to work with two types of batteries and opening the battery compartment on the vehicle can be a hassle. Even with its powerful mountainous grip, climbing isn’t so amazing on steep slopes. The model is also lagging behind in the speed compartment, but that makes it’s a cheap option for children to play. It can really be confusing using two different types of batteries, for the car and the remote control. If you’re looking to enter the realm of RC cars, then you’ll want something that gives you a powerful impression through a solid driving experience. You’ll not go wrong with the HOSIM RC track. It features a powerful motor. The truck is 2WD equipped with an aggressive GP brush 90 motor guaranteed to provide power worth a truck of its price tag. It comes with a 2.4GHZ radio system with a working range of not less than 100meters. It’s also shipped with the Li-ion 9.6V 800mAh battery with a charger. With such accessories, it’s possible to reach speeds of up to 33MPH. You should make sure that the charger is connected properly to avoid destroying the batteries from power surges. This model features an S-truck suspension system for superior handling. You not only look cool hitting the road with this machine, but you also feel in control. This truck comes with a box ready to run, so what you get here is a hobby-grade powerful truck at a toy’s price. It also features rubber tires with sponge insert and a rear wheel drive with a ball bearing. Besides these impressive features, the truck’s circuit board has been designed to protect from overheating. The battery is a low voltage model that comes with a device specially designed to protect against overcharging. The HOSIM truck is great for driving off-road and on the sand. The truck comes with real interchangeable parts, and packs sufficient speed to pull off donuts as well as slides. If you’re into RC trucks, then you know that loose dirt provides great play time. The truck boasts of a lot of speed and a decent size. The truck’s wide stance makes it possible to make sharp turns. When the truck crashes, the wheels get the impact first instead of the chassis. This is stemming from the fact that the rear and the front wheels protrude a bit from the frame at the front as at the back as well. Also, the fact that most items it crashes into won’t just phase it makes this truck a great option for beginners who are just looking to get a feel of things. Some users claim to have tested the range at 200ft, but it's promoted to work at 100 ft. The HOSIM truck is versatile to run on various surfaces, whether off-road or on the sand. You’d love this car at first sight if you’re looking to give yourself or your kid a car race experience. Its scale is 1/18 featuring a 2.4 GHZ radio technology. Going by its size and that of the motor, the Babrit F9 is suitable for both indoor and outdoor driving. It can reach a maximum speed of 50km/h and its shock suspension protects it pretty well. 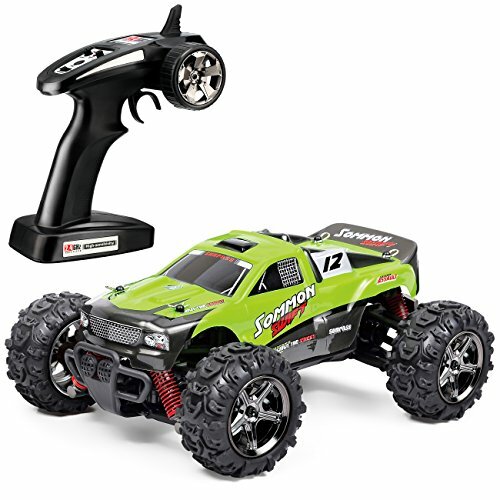 This is an RC truck racing vehicle featuring anti-interference and great value for money. It comes with four wheels’ independent suspension with a firm and sturdy structure. The car is however not recommended for racing on sand and wet surfaces. The accompanying rubber wheels are of high quality and will give you an amazing experience with RC cars. The car will be delivered together with a controller and a charger. The car will climb along with moving forward and backward, and turning to the left and to the right. Its full charging time is about an hour, which will give you a maximum of 20 battery minutes. The remote control stays connected to the car for up to 80-100 meters. The Tozo RC car comes with a control of up to 100 meters and a powerful motor. It can reach speeds of up to 32 MPH, which will give you real-life experience. Being a 4WD electric power car, controlling will be much easier and you won’t have to collect fuel from time to time. This car has a huge power of 2.4 GHZ and thus performs better than most of its counterparts with radio technology. It can handle all stunts and races with any form of RC cars. You can easily assemble all the parts with a screwdriver. This is made easy as all the parts have a number and the procedure for assembly comes with the kit. All the parts are made of metal to give the body proper rigidness. 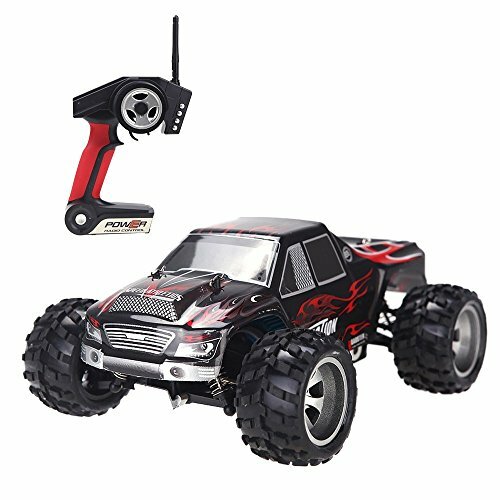 ​What to check when looking for RC cars under 100 dollars? Tires – You should keep in mind what you need to use the car for. Do you want to race with your peers? Do you want to race over the pavement, dirt, or on a tougher terrain? No matter how you want to use your RC car under $100, ensure that the tires can stand up to the challenge. Some cars have tires with heavy-duty treads that increase traction. This is a better option if you intend to race on slippery surfaces like grass or mud. Other tires that aren’t heavy duty are aesthetically appealing, which would be perfect if you want a particular model replica. Speed – what’s the maximum speed you’d want your RC car under 100 dollars to reach? You may want your preferred RC car to have a brushless motor. These are motors made from components that don’t grind on each other. As a result, they don’t overheat even when you’re driving at the highest speeds. Therefore, a brushless motor is quite a boon. The most powerful brushless motor in the market will allow for speeds of more than 65 miles per hour. Therefore, when you are looking for RC cars under 100 dollars, try as much as possible to get one with a brushless motor. Nowadays it’s possible to get models that have brushless motors that can deliver speeds of more than 30 MPH. Off-road capability – Off-road capacity of a vehicle is very important in case you’d want to drive it anywhere except on level dirt and pavement. Will you need your car to climb over rocks or slide over wet areas? You may also need it to power through mud. If this is the case, then you need a car optimized for off-road use. 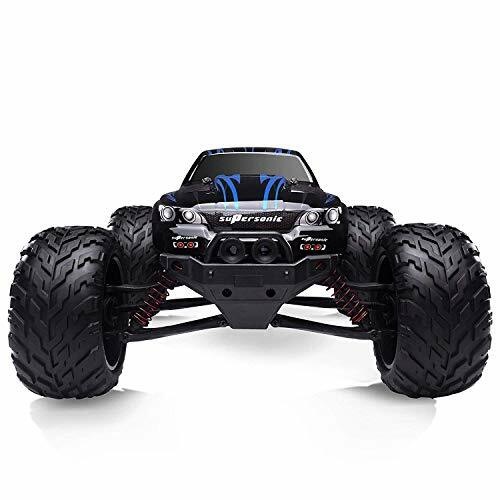 Off-road optimized RC cars normally have tire treads delivering great traction, protected gears, and a suspension system dedicated to off-road use. Durability – Durability is of utmost importance when it comes to RC cars. You’ll want to buy something that will handle everything you throw at it. A good RC car should bounce back after a crash or two. You should keep this in mind in the event you want to race or play with younger children. Accidents happen often, and this is why you should go for more durable materials. Metals are definitely the most durable materials. The RC car you go for should at least have some form of specially designed chassis for protection. Transmission distance – Transmission distance is something else you need to keep in mind. You won’t be racing too far, since you can only control the car as long as you can see it. Nevertheless, you’ll want a transmission distance long enough to let you enjoy, particularly if you’re planning on racing. Unfortunately, if you’re looking for budget RC cars, you’ll most definitely be sacrificing the transmission distance. But the good thing is, even under $100 you can still get RC cars with a transmission distance of at least 50 feet, which is still acceptable. Some even have longer distances, so transmission distance shouldn’t worry you too much. Waterproofing – Some RC cars come with sealed electronic components, meaning that they’re completely waterproof. You’re unlikely to find a completely waterproof RC car under 100 dollars, but it’s possible to get semi-waterproof models. With a semi-waterproof RC car, you can race though puddles, mud, and virtually any kind of weather. You only need to be careful that it doesn’t sink: this isn’t a boat. Charging time – There’s a high chance that the charger that will come with an RC car under $100 isn’t going to be the best in the market. A good number of them will provide you about 10 minutes of play and several hours of charging. However, you can look for a charger that will charge fully in as little as 90 minutes and offer you plenty of play time. If you’re looking to buy RC cars, there are several models affordable enough and still compete fairly with their more expensive counterparts. A good number of RC models comes with premium features to give you real-life experience. You need to do your assignment well and choose one model that fits all your hobby needs. They come in different designs, different prices, the ultimate choice lies with the buyer. It is prudent that you invest in something that gives you piece of mind, a sofa that gives you satisfaction in every sense. Finding value for money is important, especially when it comes to making expensive purchases.